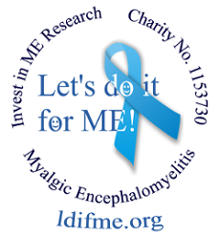 Jo’s asked me to talk about my fundraising for Invest in ME. Actually it was done in a back- to- front way and I'll explain later what I mean by this. But first I should begin by telling you about my connection with this horrible condition: I’m the mother of someone who developed this in 1994 while at university. In 1997 he spent ten weeks at the National Hospital for Neurology in London, arriving there unable to sit up, barely able to speak, but leaving ten weeks later able to walk round Queen Square, and returning home, knowing he could push through and he’d be better. His experience at this time consisted of extreme exhaustion. He was about 60% recovered when he fell ill with what emerged to be glandular fever. Epstein-Barr – From then on, in 2003, he has suffered from severe M E with additions, vertigo, tinnitus and a host of other things. Like all of you, he has fought – he’s a jazz musician, practising daily when he can. Tried everything, everywhere, medicines and alternate therapy – but nothing has helped. A little about me: while Richard was at university, I rediscovered my old love of writing, joining a women’s writing group in Manchester and beginning to publish seriously in the year 2000. For an MA in writing the children, I wrote Rafi Brown and the Candy Floss Kid. It was my third novel, and after many rewrites, I decided to set up my own little publishing house, Red Bank Books to publish it, in February 2013. There followed, a great learning curve, working with Illustrator, Heather Dickinson and book designer in Texas (!) Who helped enormously with the layout and provided the correct PDFs for printing. Like other writers, I write about people I have known or people I know, but transformed into new characters – Rafi is based on someone I knew well, he was dyslexic but is now a very successful person. I wanted to show that people with disabilities, are people first and foremost, within innate qualities, there if you can see them. Rafi just appeared to me, I could hear his voice, and I had an idea of the plot, which changed when Candy Floss emerged in a park nearby. If you read the blurb later, you will see that she has a secret, revealed near the end of the book, which I don’t tell children, and if you buy the book, or download it free for M E awareness month, please don’t tell children who might read it! But I can tell you, Candy’s mum, Gemma, has M E, and after awful things happening with a social service carer, Candy, aged 11, looks after her mother on her own! Now – fundraising –all the proceeds I’d made from selling this book since February, 2013 have been donated to Invest in M E. So that’s why it’s back to front. And I managed to complete the cell I'd chosen on the matrix rather quickly! I've been involved a little with IiME for some years, buying copies of Lost Voices quite a long time ago. Because I 've now started writing other things, I’m not promoting the books so actively until I recalled it was M E awareness month. Please do download it, even if it’s hard for you to read, maybe someone else in the family will read it. Please share this with your friends. The more downloads there are, the higher it will go on the Amazon website, and then I hope very much that it will be seen by many more people, and they’ll find out something about M E.
Please do share this,if you can. And as one picture is work a thousand words, I thought I might add a couple -which hasn't quite happened so I'll post this and try again soon. Warmest wishes to you all for better days, weeks, months and years!